There are several competing narratives about the current state of health care spending. There is the general prevailing theme that spending is unacceptably high both as (1) a share of GDP (flirting with a new all-time high) and (2) as compared to other countries. Specific elements, most recently prescription drug prices and out of network provider bills, are sometimes singled out as being particularly egregious, even within the more general context of unacceptably high overall spending. Yet against that general backdrop, there has been a counter narrative in recent years. Some suggest that perhaps the current growth rate in health care spending is (1) not as high as it used to be, (2) that we are beginning to “bend the cost curve”, and (3) approaching a new status quo in which the growth of health care spending moderates. Support for that supposition can be found from both government and the private sector. Projected spending in Medicare, where per-enrollee spending growth has been below GDP over the last five years, is expected to be below medical trend over the next decade. Medicaid spending and enrollment growth has also slowed of late. For commercially insured populations, the Milliman Medical Index reported the lowest rate of increase in group coverage for a family of four in fifteen years this year. Some have attributed this slowing in spending growth to alternative payment models and changes in benefit design that transfer more responsibility to patients, while others have given primacy to the recession. Despite an expected spike in spending that occurred during the unprecedented coverage expansion in 2014 and 2015, data from late 2015 and early 2016 suggest a return to the lower growth rates. However, the most recent trend report from the Altarum Institute suggests that perhaps it is time to rethink assumptions about moderate growth, as it states: "The growth in health spending has yet to exhibit the expected slowdown in response to the leveling off in expanded coverage." In other words, while growth in coverage has leveled off in 2016, the trend in health care spending has not returned to pre-Affordable Care Act (ACA) levels. Using data from the Bureau of Economic Analysis (BEA) that incorporates the most recent Census Bureau Quarterly Services Survey (QSS), the report shows trends in two major categories of health care spending, prescription drugs, and health care services. In a notable role reversal, the primary spending driver of late appears to be health care services. 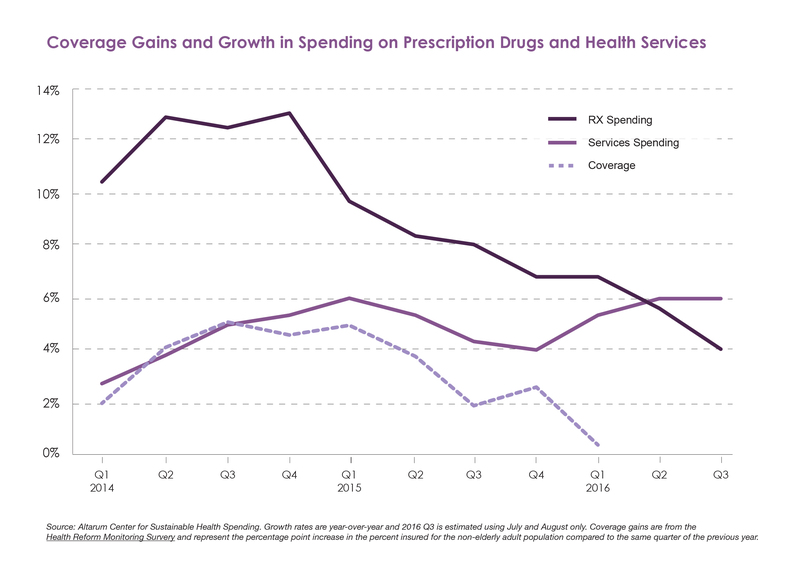 The BEA data suggest that growth in drug spending has been declining since the end of 2014, in part because of reductions in both utilization and price of Hep C therapies. After growing at rates above overall trend since 2014, spending growth on prescription drugs has fallen to an estimated four percent in the third quarter of 2016. The rate of growth in spending on health care services, however, has been increasing since the last quarter of 2015, surpassing drug spending for the second straight quarter at a growth rate of roughly six percent. Furthermore, the respective roles of prices and utilization defy common expectations. 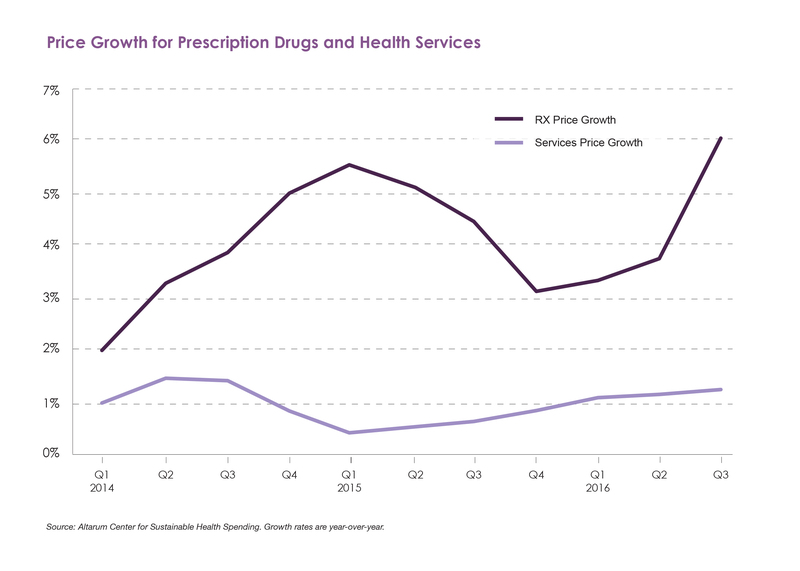 In the case of prescription drugs, it would appear that price growth has been increasing, which implies that the decline in overall spending is led by reduced growth in utilization. In the case of health care services, the reverse seems to be the case, as prices appear flat, suggesting that utilization has led to the growth in spending. Yet these trends must be interpreted with caution. Utilization is inferred from data on total spending and prices, but the relationships are not straightforward. Prices for both drugs and health care services have become increasingly complex. In the case of drugs, the intricacy of the supply chain is at issue. The consumer price index for prescription drug prices, for example, does not incorporate the impact of rebates, which some say are growing in importance. This may mean that prices are rising less than it might seem, implying that growth in utilization has been greater. In the case of health care services, on the other hand, our measure of prices may be an underestimate, if it does not completely capture value-based payment. If this is so, the estimate of a flat trend in prices may be too low, suggesting that the estimated growth in utilization may be overstated (as suggested by third quarter earnings releases of for-profit health systems). One tricky aspect to this story is that the signs of utilization growth are difficult to find. Hospital admissions appear flat at best in most areas, Medicare expenditures per enrollee are down, and Medicaid spending growth seems to be declining as new enrollment slows. Some recent estimates suggest that ambulatory care volume is softening. One trend that has continued in recent quarters has been the pace of provider consolidation, both vertical and horizontal. The relationship between consolidation and health care prices is well known, making the continued flat line service prices somewhat of a surprise. One series that is consistent with utilization growth is health care job growth, which remained strong in the first three quarters of 2016, although it is at last showing signs of softening in Q3. Yet as has been frequently noted, the relationship between health care employment and health care service utilization has also become less straightforward, as managing utilization is often the goal of value-based care, suggesting that growth in health care employment may not translate necessarily to increased utilization. Health systems are also busy adding new population health architecture, thus hiring with no provider impact. While these preliminary data cannot answer all of our questions, the top line is clear. Since the period of rapid coverage expansion ended in 2015, aggregate health care spending growth has not returned to pre-ACA levels. For the first time in quite a while, health care services spending is growing faster than spending on prescription drugs. It remains to be seen how long this trend might last, and what respective roles might be played by prices and utilization.